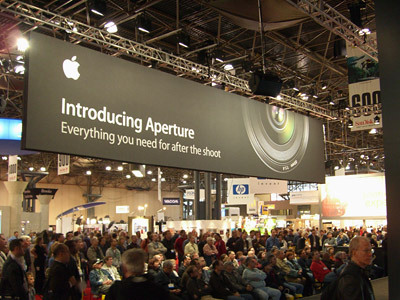 Apple with its new product, "Aperture" has been a big star at PhotoPlus Expo in NYC. Photo courtesy of Scott Sheppard - Inside Mac Media, Inc. I've heard from many sources that Apple's presence on the PhotoPlus Expo trade show floor added the extra boost of energy that the event needed. Apple chose this venue to unveil Aperture, its new pro workflow solution that's particular appealing to Raw shooters. I'll cover more on this software in the coming weeks. Rob Schoeben, VP of Applications Marketing, introduces Aperture at the Apple press event in NYC. Photo courtesy of Scott Sheppard - Inside Mac Media, Inc. 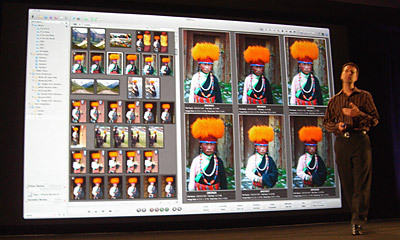 In a nutshell, Aperture is designed to make your Raw workflow as painless as managing Jpegs. The engineering team has spent almost two years researching how photographers like to work and what's most important to them in post production. The design team took what they learned, combined it with the power of Tiger, and created Aperture. This isn't iPhoto. It will cost you $499. For pros, it's justifiable because at $100 an hour in time savings, you get your money back quickly. To really appreciate this app, you have to see it operating on two side-by-side 30" displays. (Today's hardware announcements are in concert with Aperture and Final Cut Studio.) This is particularly helpful when you're culling images -- placing them side by side at 100 percent -- trying to quickly determine which are the best. On the downside, the hardware requirements are pretty steep for this application. If you have an old Mac... forget it! 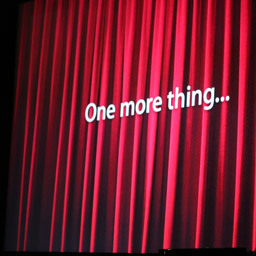 This week Apple is making another big announcement in conjunction with PhotoPlus Expo. I think we're going to see some serious photography tools coming our way. 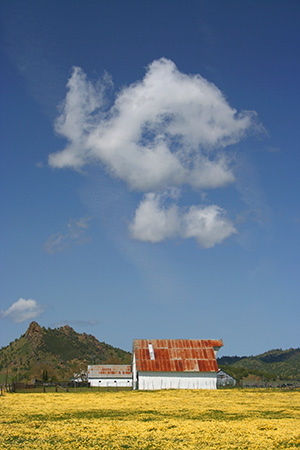 For more musings on this, see my O'Reilly weblog, Ladies and Gentlemen, It's Photography Time. I mentioned yesterday that my normal workflow for Raw images has been disrupted by the new .CR2 files from the Canon 5D DSLR. Neither Adobe Bridge nor Apple iPhoto 5 allow me to browse these Raw thumbnails. Once I find a file I like, however, I can open and edit in Camera Raw. Looking for a temporary workaround, I decided to open the folder of Raw files from the recent Apple "One More Thing..." event in Canon's Digital Photo Professional software that comes bundled with the 5D DSLR. 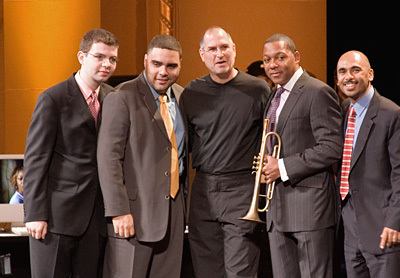 I selected the post-event group shot with Steve Jobs and Wynton Marsalis that was captured from across the room at ISO 1600 with no flash. The first thing I noticed was that the user interface for Canon's software had improved over their other apps I had used in the past. I was able to quickly locate my Raw files and open their thumbnails. You can rate you pictures with a "check" system, sort by rating, rotate, and view the metadata. To edit, simply double-click on the image. Most of the basic tools are there. I played with white balance mostly, but tried brightness and curves too. When I was finished, I had the option to convert and export the data as an Jpeg, 8-bit Tiff, or 16-bit Tiff. I chose 16-bit Tiff. I would have liked to have a Photoshop file choice too though. Once I opened the Tiff in Photoshop, I made a few more adjustments to create the picture you see here. Overall, I prefer the Bridge/Camera Raw combination, but for the time being, will probably use the Canon software for browsing my Raw files, then actually work on them in the Adobe software. 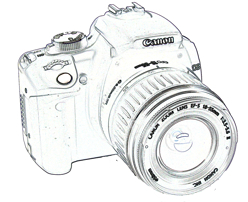 I am glad, however, that I tried Digital Camera Professional. It's an attractive way to view and sort your Raw pictures (Jpegs too!)... and it's bundled free with the camera. 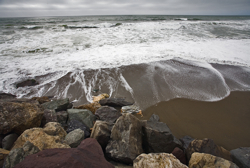 I was in Pacifica, CA today for an appointment and had a chance to test the Canon's 5D Raw format. I must say, it was quite exciting to attach my 17-40mm f-4 zoom to the 5D and see the world full frame at 17mm. The 5D kept up with my pace of shooting and didn't slow me down as it recorded in Raw. Processing the images was another matter. Adobe Bridge couldn't generate thumbnails for the .CR2 files (Raw on the 5D), nor could iPhoto 5. I could open the images by dragging them to Photoshop and editing in Camera Raw 3.2. But to browse the thumbnails, I had to use Canon's Image Browser application. I'm hoping that we'll see updates to Bridge and iPhoto 5 soon. In the meantime, my workflow is a little clunky for Canon 5D Raw files. 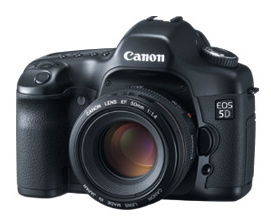 My Canon 5D has just shipped from B&H Photo. While I wait for it to arrive, I've been chatting with a couple photographers who are already using it. James Duncan Davidson has been shooting with the Canon 5D to cover the Web 2.0 Conference in San Francisco. He's really thrilled about the images he captured at high ISOs, even up to 3200. I examined them myself (you can too), and I must say they are stunning. It appears that this camera is destined to become the darling of many photojournalists and wedding photographers. More on this soon. I spend quite a bit of time thinking about how to explain things I've discovered. For example, right after I figured out how to use the High Dynamic Range command in Photoshop CS2, I wanted to show it to others. Even during my learning process, I was capturing screenshots and making notes for an article. You'd think I'd find this obsession distracting. But it isn't. It's fun. Creating an outlet for these discoveries is part of the reason why I've started The Digital Story site. Despite the books I write, classes I teach, and articles I publish for O'Reilly Media, there's still more bouncing around upstairs. Everyday stuff like, why I like one camera model over another, what's the best USB mic for podcasting, and how to make real movies with cheapo digicams. This is the kind of stuff that I'm going to cover here. I'll make regular written posts, will produce a weekly audio show (that you can subscribe to), and share lots of pictures. The tagline for this site is "new tools for the creative mind." They can be as sophisticated as a digital SLR camera, or as simple as nylon stretched over your lens to make a diffusing filter. Regardless, I'd like this to be the office water cooler for those discussions. I hope you'll stop by often for a drink. Oh, and one other thing... the title of the site: The Digital Story -- That's me, Derrick Story. And I'm definitely digital. I was flipping through the just-released Digital Photography Pocket Guide, 3rd Edition, and I thought this would be a great time to share some shooting tips. First, don't let your digital camera get too hot, as in the glovebox of your car. We've seen that hot image sensors produce more image noise. So treat your digicam with the same care as your film-loaded 35mm camera. If you've made the switch to digital, and you're thinking about selling your 35mm SLR, be sure to hang on to all the filters, step-up rings, lens hoods, flashes, pouches, etc. I keep my stuff in stackable boxes that are marked on the outside. I can't tell you how many times I've found the perfect accessory in one of those boxes to tackle a job with my new digital camera. By repurposing this stuff, you'll save yourself hundreds, maybe thousands of dollars. Shade your lens when shooting in bright conditions. If the sun is shining directly on your lens, you'll lose contrast at best and gain lots of flare at worst. Use a lens shade, your hand, or a copy of The Digital Photography Pocket Guide to keep stray light off your glass. Keep a plastic ziploc bag in your kit. You never know when Mother Nature will rear her head and hit you with rain or swirling sand. A plastic bag to protect your camera is a godsend. And if you're shooting outside on a cold night, put your camera in the bag before coming back indoors. That way the condensation will form on the bag as everything warms up, not the camera itself. And finally, take lots of pictures and don't forget to archive them. The joy of digital photography is the freedom to shoot, shoot, shoot. But also get yourself an extra FireWire drive, and backup, backup, backup.